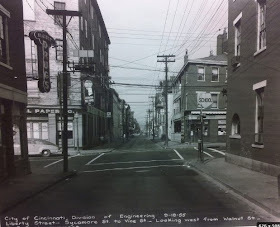 This of photo of Liberty Street looking west from Walnut Street in 1955 was recently posted on Facebook. Here is the same view today. 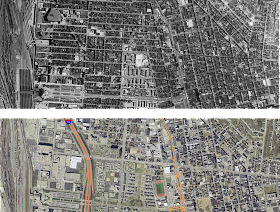 This big difference got me wondering when and why Liberty Street was widened. The great people at the Public Library of Cincinnati and Hamilton County sent me many articles which helped to explain. 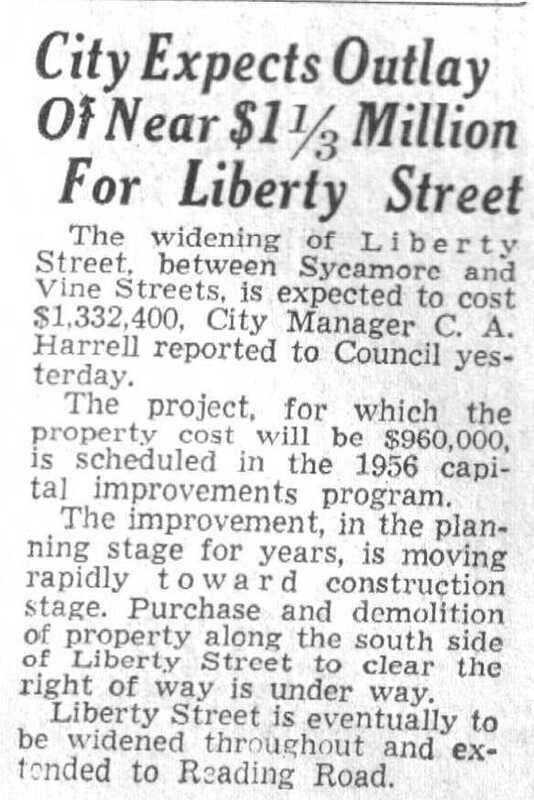 But let's step back in time to find out how Liberty Street got its name. When Cincinnati was incorporated in 1819, the northern edge of the city stopped at Liberty Street, then called Northern Row. 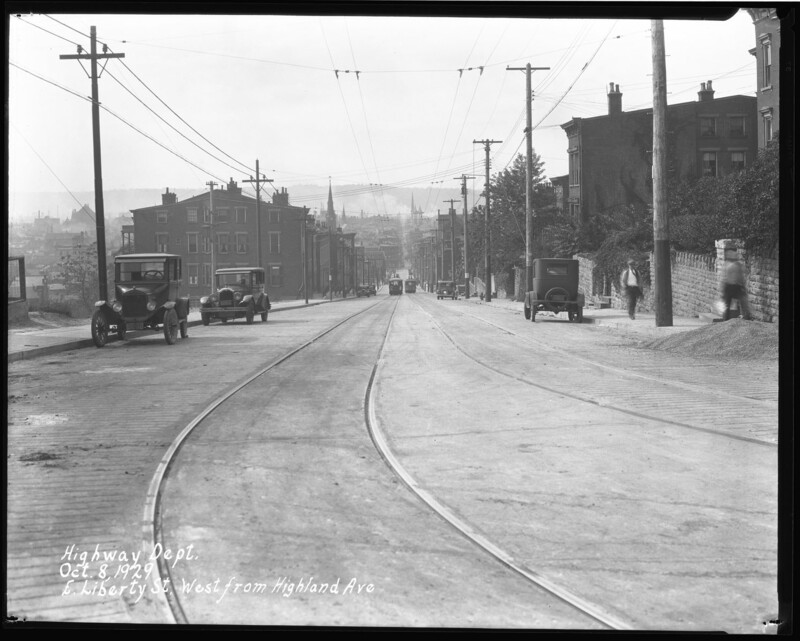 Anything north of this line was not subject to the city laws, and became known as the Northern Liberties, where saloons, gambling and other institutions, such as Catholics (just as Brother Tim of St. Francis Seraph), found their freedom. By 1838, Northern Row/Liberty Street (both names appear on the map above) ran from Freeman Avenue to Highland Avenue. Already this road was an important west to east thoroughfare. 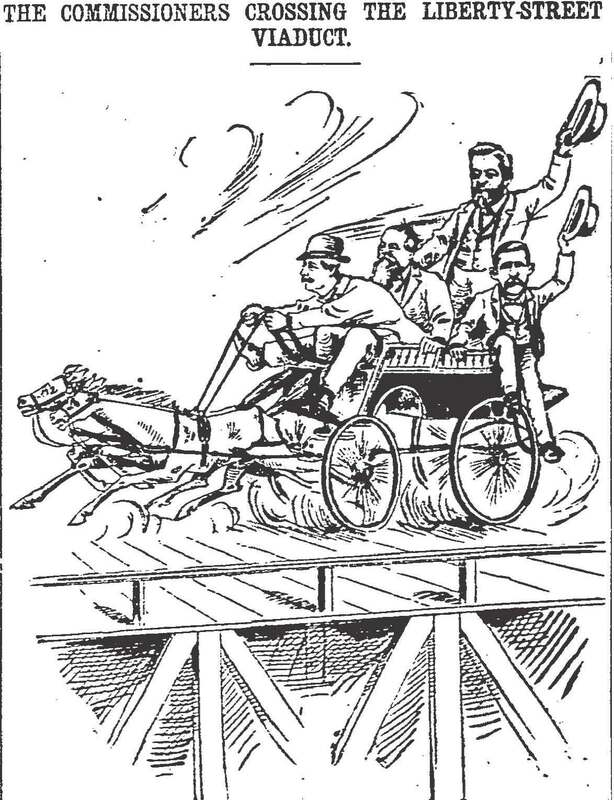 In 1869, the street now ran from the Mill Creek to Highland Avenue, but a bridge over the creek was not constructed until 1891, after over 14 years of discussions. At the time, it was the largest bridge constructed by the county at the expense of $135,000 ($3,397,058 in 2012 dollars with inflation). 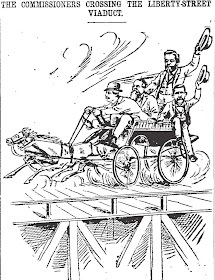 However the viaduct was only wide enough for wagon and foot traffic. Just two years later, complaints were lodged that the bridge was not able to accommodate streetcars, poorly maintained and unsafe. By 1908, calls were made for a new bridge but repairs were made instead. 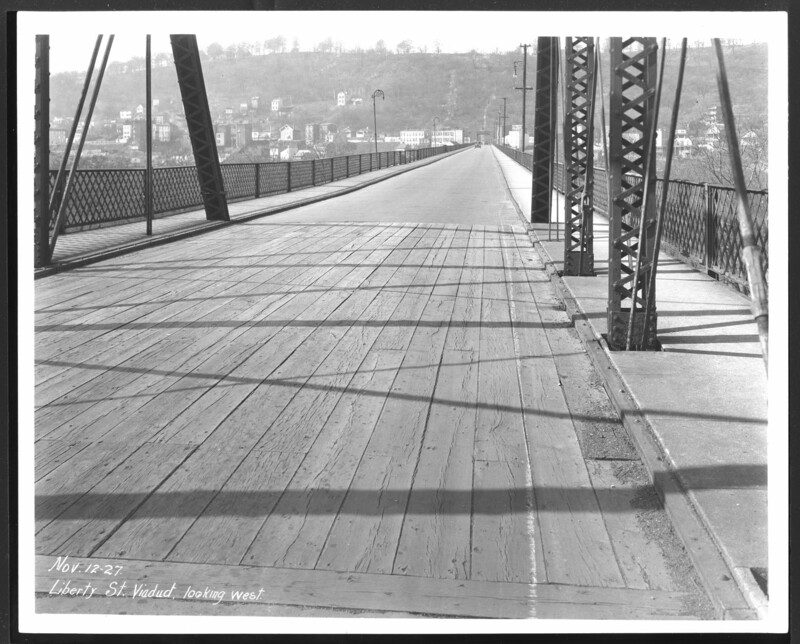 It is unclear from my research that photo below from 1927 is the same bridge. 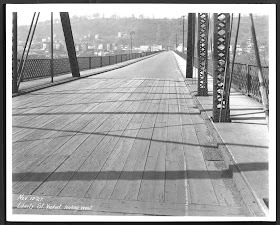 The bridge was demolished before 1949, possibly around 1929 with the increased rail traffic from Union Terminal. It was removed in 1929. In 1942, maps were drawn to allow Liberty Street to become a six-lane road of 84 to 91 feet between John Street and Broadway however action was not taken until 14 years later. In the map below, you can see where the old properties were located that were purchased and demolished to make room for this wider road, constructed at 70 feet. It took over 4 years for the project to be completed. It was noted in an article in the Cincinnati Enquirer on February 6, 1958 that Liberty Street was an important connector between the Millcreek Expressway (I-75) and the Northeast Expressway (I-71). 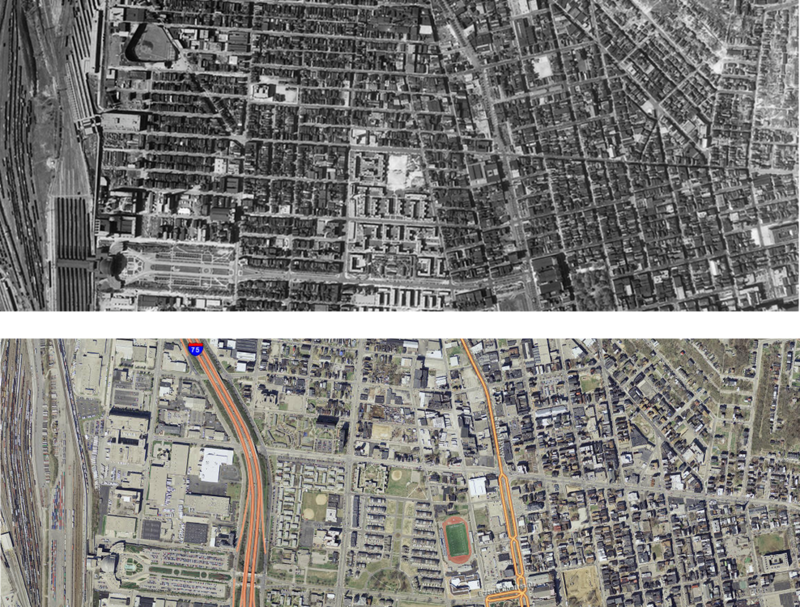 You can see the red outlines of the parcels demolished on the south side to make way for the wider Liberty Street. This occurred along the length of the whole street. 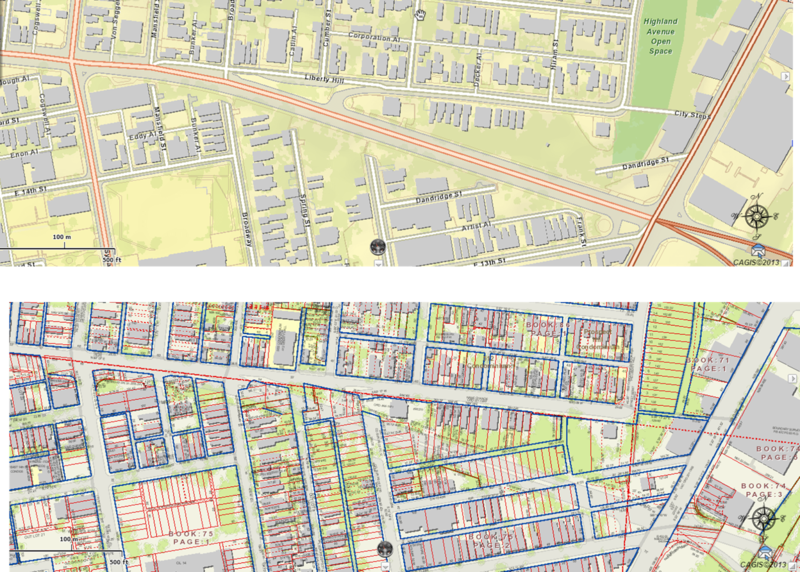 In 1968, complaints were lodged by residents of the Pendleton area, when Liberty was straightened in order to connect to Reading Road. Many north bound streets were blocked off between Sycamore and Reading Roads, leaving the neighborhood feeling disconnected and Liberty Street unsafe for school children to cross. Their pleas fell on deaf ears. 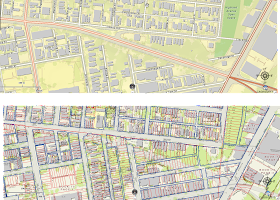 2014 CAGIS Map between Sycamore and Reading. Lower map shows the parcel outlines. As reported by Building Cincinnati, Liberty Street is now under consideration for a "road diet" which would reduce the with of the road. 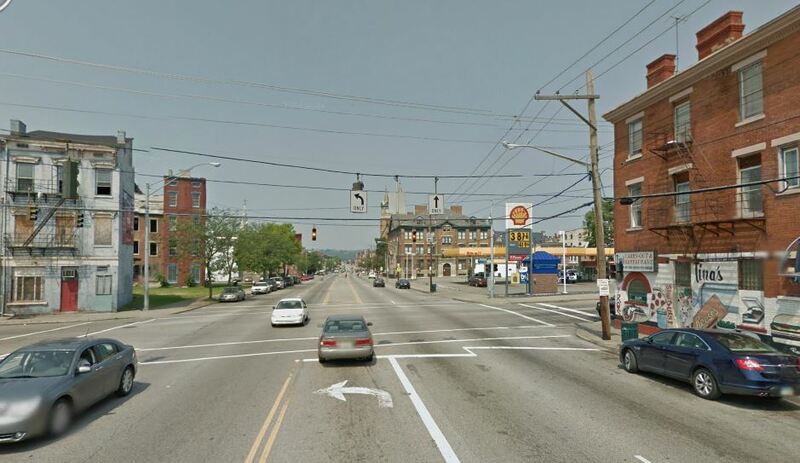 This would allow the northern and southern sections of Over-the-Rhine to feel connected once again, improve the streetscapes and add bike lanes. Everything old is new again! It's sadly not an uncommon situation in the city (and many others). Many Cincinnati streets were widened like this in the 50s through the 70s to allow for more automobile traffic because...shut up! Linn Street, Bank Street, West 8th Street, Jefferson Avenue, MLK via its predecessors (Hopple, Dixmyth, St. Clair, and Melish), parts of Gilbert Avenue and Victory Parkway near I-71, and Dana Avenue in Hyde Park were all widened or built new at a 6-9 lanes wide. 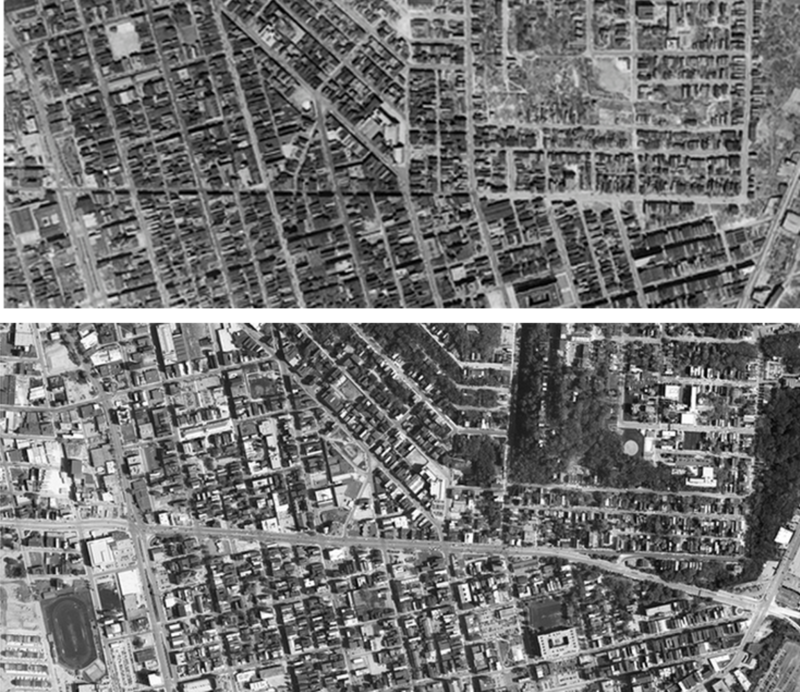 It was not only to facilitate more driving, but also to clear away what was (and in many cases still is) perceived as blighted neighborhoods worth treating like like weeds in a ditch. The damage was extensive and the wounds very difficult to heal. Sadly it still continues, and Covington just recently completed their own 1970s-era road widening of 12th Street to 7 lanes. Same with Reading Road next to the casino. I love this post! 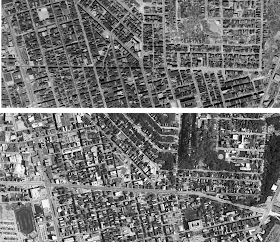 I live at 548 E 13th which was directly affected by the widening of Liberty. The city had to take a small corner of the back of our property in order to facilitate this project (specifically to allow Frank St. to connect to Artist Alley) As a result, our building lost its former carriage house from the back of the property leaving an unsightly half torn down wall that is still standing today. In fact, we are getting ready to renovate the back of our property in the next few weeks and that wall will finally be coming down after standing like that for 60+ years! Jason, do you have any pics?? ?